For the alphabet X, since we don't have any country beginning with X, we decided to cook from any city that starts with X. So, i decided to cook from Xaxaba, Botswana. It is a landlocked country in Southern Africa, where 70% of the country is taken up by Kalahari Dessert. Food shares some characteristic with other african cusines, but then they have their unique food too. The Mopa worms, which look much like a caterpillar are a delicacy which are cooked in hot ashes or fried, sauteed!!! Other famous food is ugali, cooked maize flour. What caught my attention is their Diphaphata, pronounced Dee-pa-pat-ta. It is such a quick bread, all you need is an hour,to make and eat them. They are soft, puffy and amazing with some cream cheese. Oh yes, warm diphaphata and some cream cheese, it is heaven and a big glass of Orange juice, will complete your breakfast. Take together flour,sugar, salt and baking powder in a bowl. Whisk well to combine. Now slowly add milk to this flour mix and start kneading to make a soft dough. 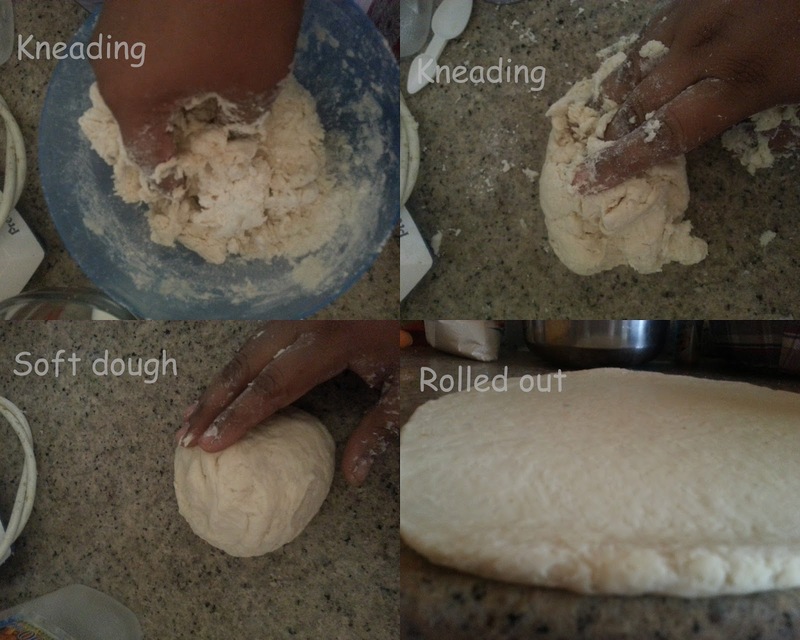 Take the dough to a flat kneading surface, I used my kitchen counter, Knead for 2-3 minutes to get a smooth dough. Keep the dough covered and let it rest for 15 minutes. After the given time, Dust your work surface with flour and start rolling out the dough about 1/4inch thick. Using a cookie cutter or sharp bowl cut out roundels about 4-5 inches in diameter from the dough. I made 3 big rounds and 3 small rounds. Heat a flat griddle,when it is hot enough, place 2 diphaphata's on the hot pan, reduce the heat to medium let it cook for minutes on one side, flip and cook the other side too for another 2 minutes. They should well browned on both sides. The bread will puff up well while cooking. Smear oil on the griddle while cooking, to prevent the bread's from sticking to the pan. Enjoy the bread warm with your favorite spread, I enjoyed my diphaphata, with some warm homemade apricot jam and few with cheese slices. Sending this to Come, join us for breakfast, happening @ +srivalli jetti's space. Very interesting diphaphata, a fabulous muffins to give a try soon. Very interesting name for the bread. Bread looks amazing. Wow Priya, that's so interesting..you really have got hold of so many breads to make..I have bookmarked so many yaar..very nice efforts! OMG ! !..i still cant pronounce that bread name..ha ha...but love its look and texture..amazing!! Interesting name and interesting stove top muffins. wow stove top muffins sounds very interesting :) bread looks fantastic dear !! Love the texture of the bread.. Looks like english muffin which can also be griddle cooked too. Muffins looks soft inside and crisp outside. Good choice ..
Love the yum breads. and stove top its a blessing. Thanks a Lot for taking your time out and Visiting my Kitchen!!!!! Your Valuable Comments keep me going!!! Feel free to ask your doubts , i will definitely try reply you back. Good Day!!! Which Sandwich are you going to make today? ?